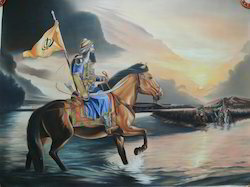 Our range of products include rural lady canvas paintings, rural men and women painting, elephant canvas painting, fort painting, guru govind singh painting and horse painting. 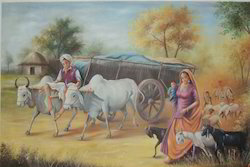 As an eminent in the relevant industry, we are presenting a superior quality range of Rural Lady Canvas Paintings. This painting is designed in compliance with set guidelines by our highly skilled professionals by using best material and leading techniques. Moreover, offered painting is inspected by quality controllers before providing to the customers in order to assure its quality. 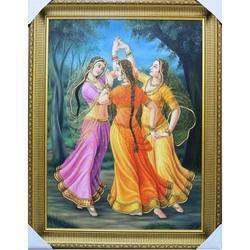 As well, this painting is provided in quality packing in numerous designs. 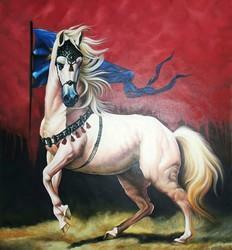 We are specialized in offering an extensive range of Rural Men & Women Canvas Paintings. Offered painting is designed by our experts by making use of excellent quality material & leading techniques as per the trends of market. 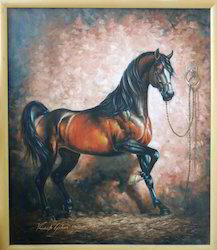 This painting is accessible in several designs & finishes in fulfillment with the needs of customers. Moreover, our product is checked from end before dispatching to customers so as to deliver a perfect range. 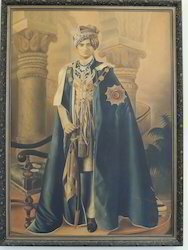 Facilitated by technically advanced process, we offer a qualitative assortment of Canvas Picture. Our offered range is widely used in companies, institutes, colleges, schools and other residential apartments. 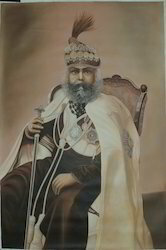 These pictures provide a stylish visual impact to the surroundings wherever mounted. We use high-grade components in manufacturing so our clients greatly trust the quality of our offered range. 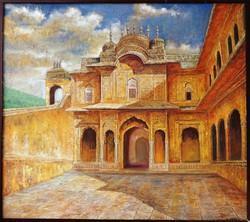 Beautiful painting of inside scene of Amber Fort Jaipur. 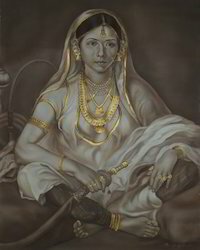 Backed by efficient and highly qualified professionals, we manufacture and export a quality assured range of Indian Queen Portrait Paintings that are made using imagination in order to provide delight and inspiration to eye. 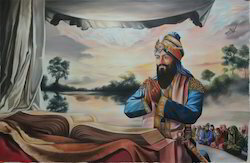 Our portraits are used for interior decoration and these are aesthetically hand painted. 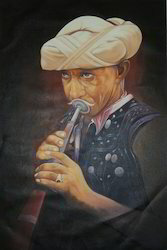 Thus, our clients can avail these portraits at market leading prices from us. 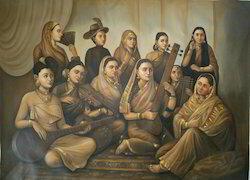 Backed by rich industrial experience, we manufacture and export a large assortment of Woman Portrait Paintings that have a huge demand in the domestic as well as overseas market due to their precise designing. 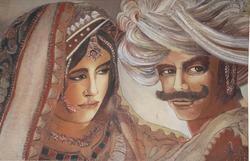 These paintings are used for interior decorations and we offer them in a reliable and protective manner to the clients. 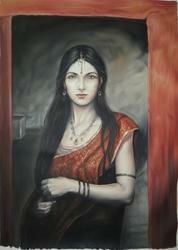 Our paintings are available in design of faithful wife and these are custom made. 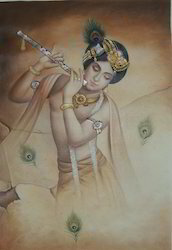 One of the exclusive painting style by senior artist Mr. Shankar Lal Soni. Available in superior finish, we design these as per the preference of our customers. We manufacture these embossing using superior quality material. Adding beauty to the wrists. Every bangle here is a rainbow in itself. The Bangle seller is selling beauty to the wrists. 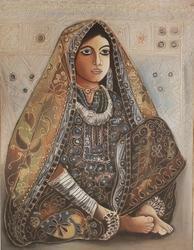 Lady holding huqa is a very famous painting of our gallery. 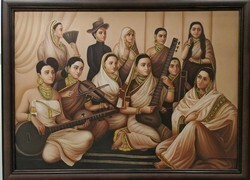 Black n white tone of painting looks more impressive in terms of expressions details. 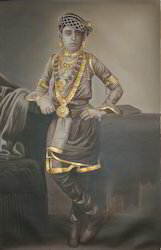 Gold filigiri work for add on beauty of lady. 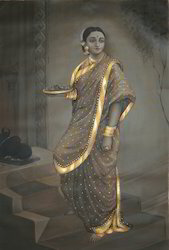 Raja Ravi Verma painting is being redefined by artist jai prakash verma with colour shade of sepia and gold filgiri work in borders of dress of lady as well as in ornaments . 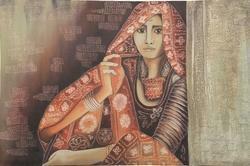 With years of industrial experience, we are presenting a qualitative collection of Rural Indian Lady Indian Canvas Painting. This painting is designed by our highly experienced professionals by using top quality material & modern techniques in strict adherence with the set norms of market. 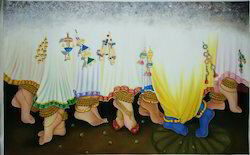 Moreover, we offer this painting in diverse customized options according to the detailed information of customers. 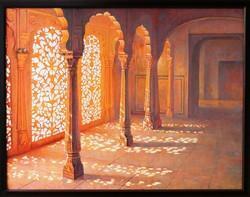 Our offered painting can be availed from us at reasonable price within a given time frame. Packaging Details: We used high quality box packing so product will deliver safe at your door. 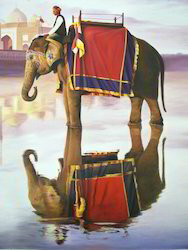 Photograph and painted by artist sachin soni. 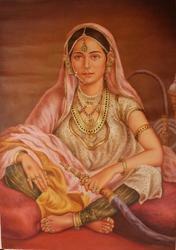 Ravi verma paintings collection by Dholamaru Art Gallery . 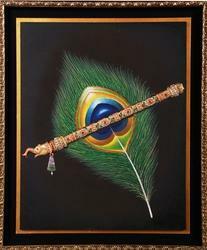 Exclusive range of Maharaja Paintings . 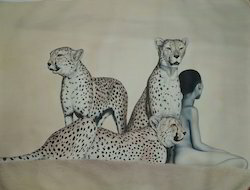 Looking for Canvas Painting ?